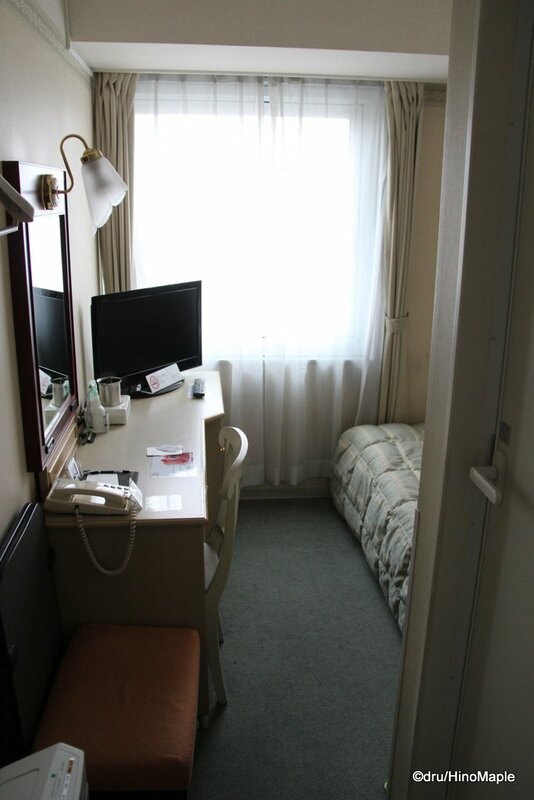 When I was in Hiroshima, I decided to stay at the Hiroshima Intelligent Hotel Annex. It wasn’t the cheapest as the hostels are cheaper but I wanted a hotel room where I could be on my own. 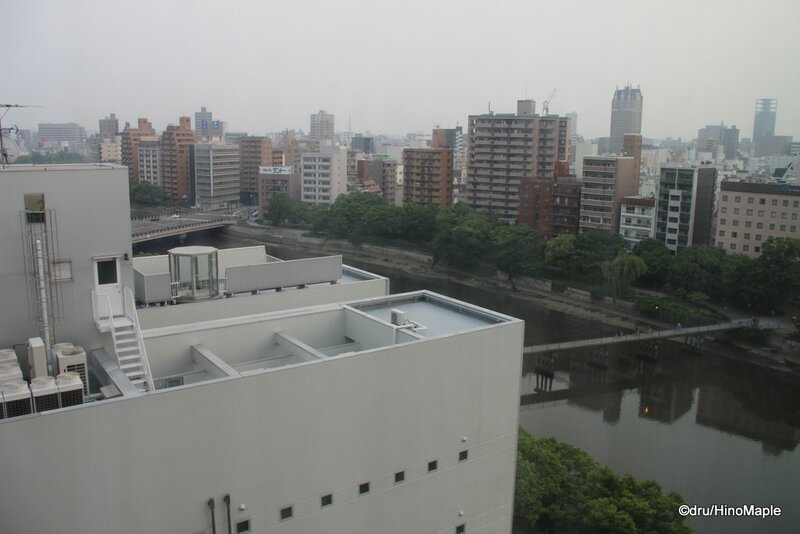 The Intelligent Hotel Annex is not as close to Hiroshima Station as the main building but it is closer to the heart of Hiroshima’s drinking district, which was a plus for me. 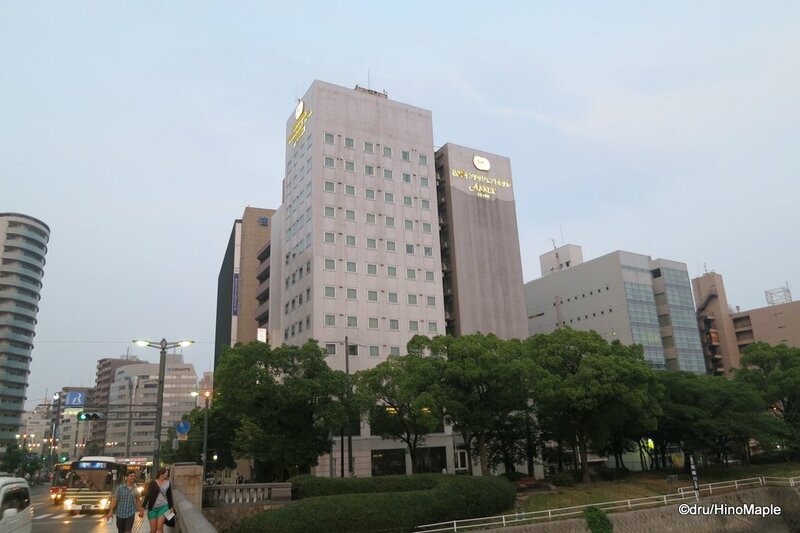 The Intelligent Hotel Annex is located about halfway between Hiroshima Station and the main shopping and drinking area that starts around Ebisucho. It wasn’t an easy walk from Hiroshima Station, considering I had a suitcase full of nihonshu. I still found the hotel very easily and it was worth it to walk rather than take the tram. 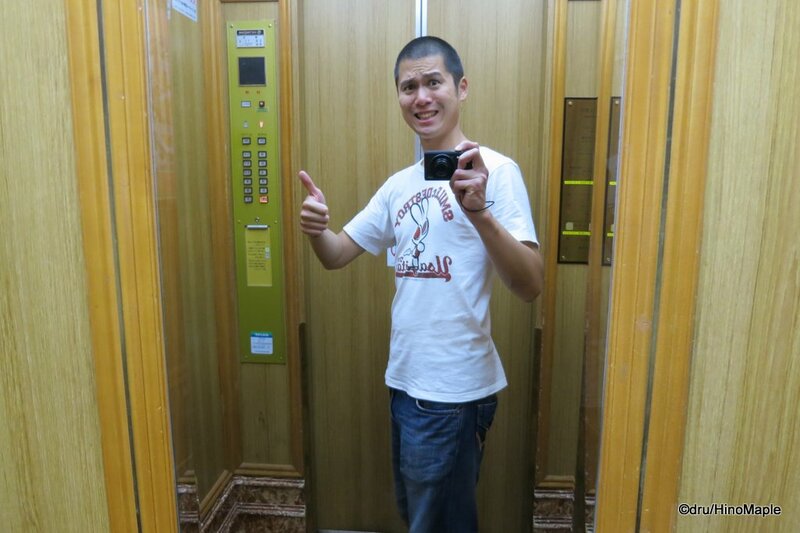 The hotel itself is pretty tall but it is also pretty old. The entrance is nice to look at and the lobby is small but elegant. The people are all pretty nice but the system is too advanced. You check in normally by telling your name and such. They then hand you an IC card which is your room key. You use this to pay at a payment machine that is located just behind you at the front desk. I tend to think that I am pretty tech savvy but I was baffled by how to use the system. I’m sure that people who go there all the time are used to it but I was completely lost and needed help when I checked in. When I got up to the floor of my room, it was dark. I couldn’t believe how dark it was. As I walked down the corridor, the lights would start to turn on. They turn on one by one as you trigger sensors. It took some getting used to but I found my room. The Intelligent Hotel Annex is actually 2 buildings that are connected on each floor. You can tell you are entering another building because the “bridge” connecting the two is easily recognizable by the risers to allow the “bridge” to float between the two buildings in case of an earthquake. Once I got to my room, I was baffled as to how to use the key. I looked all over for a place to put my key in to unlock the door. It took me a minute to figure out that the key was actually an IC card, much like the Suica or Octopus cards used for transportation. I was finally able to get into my room and I was safe. The rooms of the Intelligent Hotel Annex are pretty standard. The single room I got was good enough for a single person and the view was okay. I had a view of the river but the old glass was a bit cloudy so the view looked dirty. The amenities were pretty standard and once you start going to different business hotels, you realize that there really isn’t anything different between them. The only thing that you think about is the breakfast and if it is included or not. I was content to not pay for the 1000 yen, maybe more, breakfast and got 7-11 pastries instead. 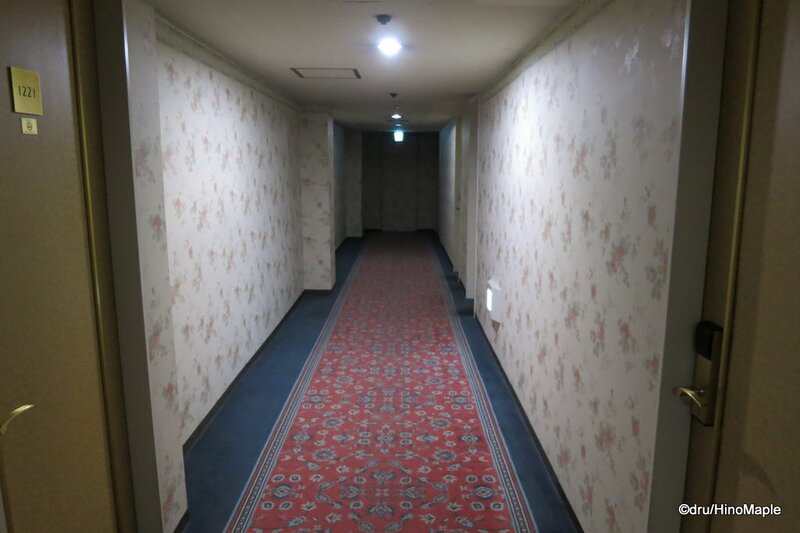 I would definitely stay in the Hiroshima Intelligent Hotel Annex again next time. I felt that it was a standard hotel but there really isn’t anything to keep my loyalty with this hotel. If there is another hotel that is cheaper, I will probably stay there. I don’t think it is worth it to spend more to stay here but if it is the cheapest again, I’d be happy to stay there. 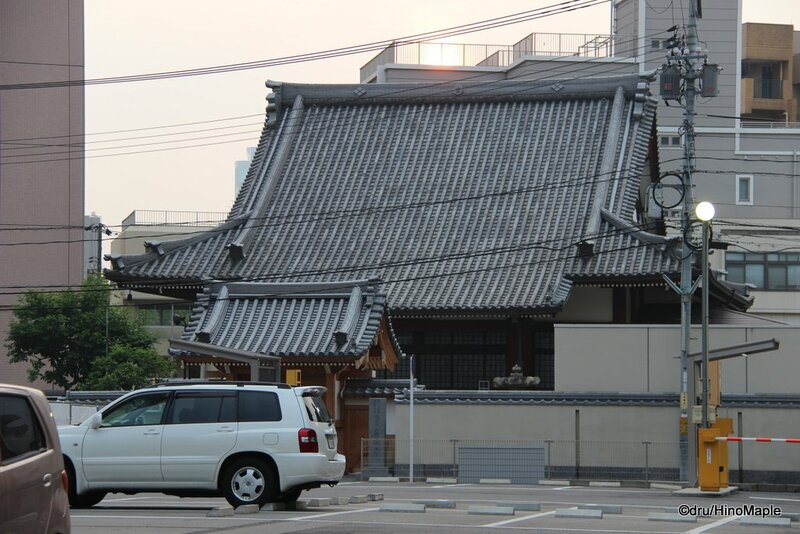 This entry was posted in Chugoku, Hotels and tagged Hiroshima, Hiroshima Intelligent Hotel, Hiroshima Intelligent Hotel Annex, hotel, Intelligent Hotel, Intelligent Hotel Annex, japan by Dru. Bookmark the permalink.